The disease is a degeneration process. It occurs more commonly in people that: are fair skinned, have high blood pressure, exposed to sunlight, smoke, and those without cataracts. It effects 20% of those between 65-75 and 35% of patients older. There are two types of Age Related Macular Degeneration (ARMD): dry and wet. Dry is a slow insidious disturbance of the macular area with accompanying loss of vision. The dry type occurs most of the time (most common 90% of the time). The vision usually does not get very bad. The wet type is due to leakage of fluids and blood under and within the macula. The effect is often devastating. The wet type if caught early enough can be treated with an Intravitreal Injection (inside the eye) of specialized medicine or we may use an ophthalmic laser to seal the leaky areas. For therapy to be successful wet macular degeneration must be identified in the early stages. Recently there have been a number of new treatments for wet ARMD. These new treatments are made up of anti-VEGF (vascular endothelial growth factors). These new drugs stop the formation of new, leaky blood vessels associated with wet macular degeneration. Current treatment includes the use of intravitreal injection of Lucentis, Avastin, Macugen, steroids and PhotoDynamicTreatment with Visudyne (which is being used much less now). These medications try to stop the development of new leaky blood vessels which cause leakage of fluid and blood and reduce the amount of inflammation. Use of these treatments by itself or combination offers exciting opportunities in the treatment of this destructive disease. Treatment is costly and may be needed to be repeated every month, but it is proving to be a very promising treatment. 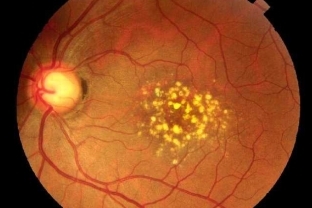 For the first time some patients with macular degeneration may have an improvement in vision with treatment or at least stabilization of their vision. In the back of the eye is the retina which is analogous to the film of a camera. 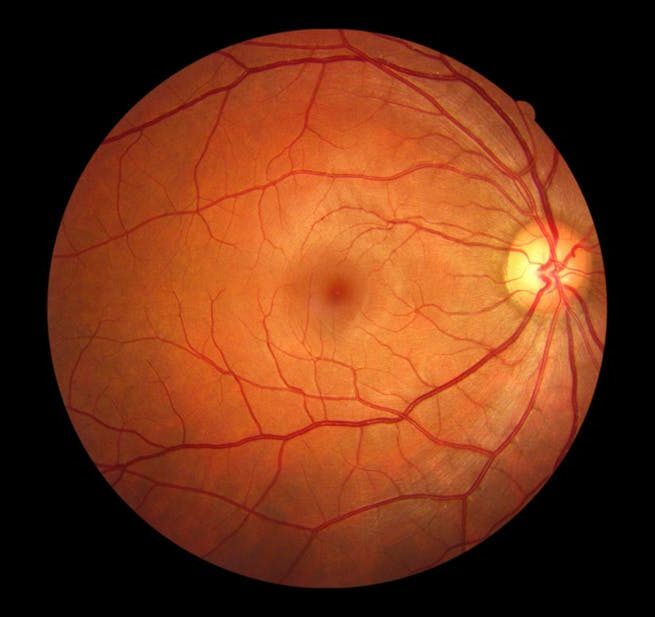 One small area of the retina, called the macula, is devoid of visible blood vessels and has the highest concentration of photo-receptors (light capturing cells). This is the area of the retina that accounts for visual acuity. The center of the macula is called the fovea. This small area of the retina is used when you look straight ahead. It is the area used to drive a car, read a book, and watch television. Unfortunately, this very biologically active tissue is prone to damage with age. The first sign of wet macular degeneration is a sudden distortion or wavy vision in one eye. If this occurs, there is a small window of time in which fluid is beginning to leak and a intravitreal injection or laser can stop the leakage with minimal damage. This is not a cure but a method of stabilizing vision. In some cases you may experience an initial decrease of vision, but studies show that the long term benefits vastly outweigh the effects of no treatment. The dry form may also cause distortion. Generally this distortion is less severe and more insidious in its development.The diagnosis of Age Related Macular Degeneration (ARMD) can only be made with special instruments to examine the back of the eye. Dr. Spencer has the latest tools to help diagnose and manage your ARMD. The Optical Coherence Tomographer (OCT) yields an unparalleled view of the macula and is used to evaluate treatment response. Either dry macular degeneration or significant wet macular degeneration may be diagnosed by visual observation of the back of your eye during the dilation portion of your eye examination. 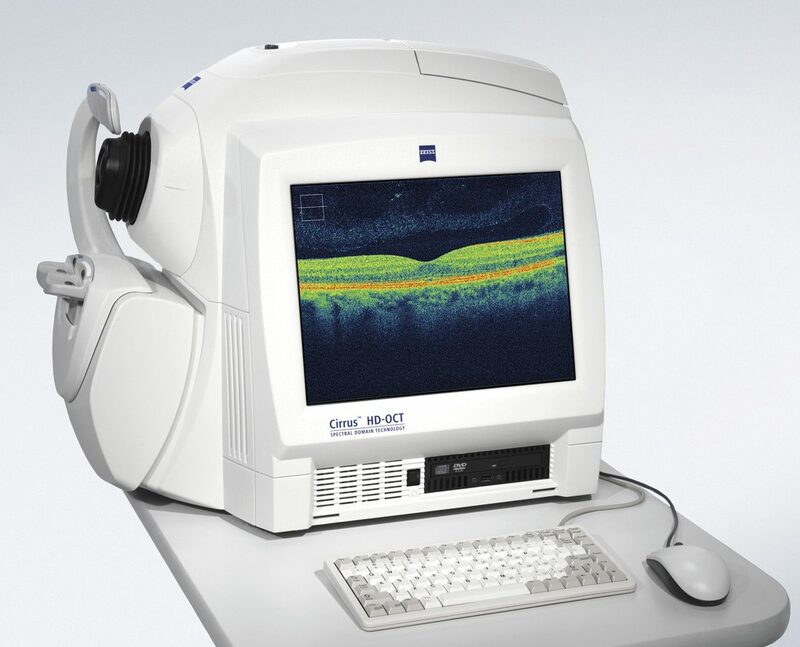 However, subtle wet macular degeneration needs more sophisticated tests such as fluorescein angiography. Fluorescein angiography is performed by injecting a dye into the arm and photographing the passage of the dye through the arteries, capillaries and veins of the eye. If there is any leakage of fluid by the blood vessels, the dye will leak out of the vessels and be seen on the photographs taken during testing. If you notice a sudden change in your vision, particularly distortion of lines you should make an immediate appointment. I Have the Dry Type Will I Get the Wet Type? Most patients with dry ARMD remain that way for years. However, patients with dry ARMD have a greater chance of developing the wet variety. 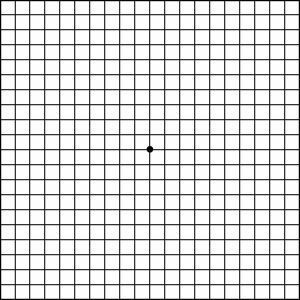 That is why we suggest that you check your vision in each eye with an Amsler Grid every day. One of My Parents Has ARMD will I Get It? There is a genetic predisposition to ARMD, thus, if your parents have it you have a better chance of getting it. However, if your parents have it, it doesn’t mean you will get it. Scientist are working on identifying genes for ARMD and the mode of transmission. Will I Go Blind From Macular Degeneration? Fortunately, the visual loss though devastating does not cause complete blindness. Peripheral vision is intact and mobility is maintained. However, ARMD makes it difficult or impossible to drive, read, or watch TV. Patients with ARMD should be evaluated for appropriate visual aids to improve the quality of life. Special glasses (magnifiers and telescopes) may be prescribed to magnify the print. Computers can be designed to enlarge print. Special viewing devices can enlarge print. Large print magazines and newspapers are available. Obviously, these devices are not a cure, but they sure help. The patient must be motivated to use them. Yes. Patients prone to ARMD should take over-the-counter vitamins which contain Lutein, a naturally occurring carotenoid, Zinc and Beta Carotene. Lutein is an anti-oxidant which is believed to block the effects of UV light. These vitamins have been designed to slow the progression of ARMD especially in the dry type. The National Eye Institute released the results of an eight year study (JAMA Oct 2001). Subjects who were classified as having either intermediate or advanced ARMD and used high potency anti-oxidants with zinc and copper showed a small but real decrease in the progression of ARMD. If you are a smoker you should not take beta carotene, take zinc with copper only. Also, UV filters should be put in to all glasses used outside. These glasses should be used even on a cloudy day, since UV light passes through the clouds. Wearing a brimmed hat decreases further exposure to UV light. If you smoke you should stop and control your blood pressure and cholesterol level. A diet beneficial for cardiovascular health is also good for the eyes – low in saturated fats, high in fruits and vegetables. Exercise is also important, since a healthy heart sends more nutrients and oxygen to the eyes. There is also evidence that dark leafy vegetables such as spinach, kale, and collard greens are helpful. A glass of red wine seems to be helpful. Stop smoking! How Should I Monitor My Vision? Click on the Grid to print out. 1. Tape this page at eye level where light is consistent and without glare. 2. Put on your reading glasses and cover one eye. 3. Fix your gaze on the center black dot. 4. Keeping your gaze fixed, try to see if any lines are distorted or missing. 5. Mark the defect on the chart. 6. TEST EACH EYE SEPARATELY. 8.Always keep the Amsler’s Chart the same distance from your eyes each time you test.